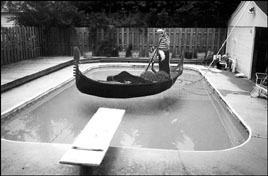 A backyard enthusiast pilots his Pool Gondola. Looking to add a little romantic spice back into your drab, sexless marriage? Maybe you’re searching for a nice activity to do with the kids? Perhaps you’re tired of going to the gym for the same boring exercise and are ready to try something new. Well stand back, we have the all-in-one product you’ve been looking for: The YD Industries Pool Gondola! From the Venice canals to your backyard pool, our Pool Gondola is sure to be the summertime envy of your entire neighborhood. With a gentle push of the paddle, you’ll gracefully pilot yourself from one end of your home natatorium to the other. You and your family will enjoy hours of unceasing fun, exercise, and old world romance. Our Gondola is constructed of genuine faux Italian Oak and is assembled by trained craftsmen in Mexico. 18 feet long and 5 feet wide, our Pool Gondola just barely fits in the average American backyard swimming hole. Each craft is pressure tested before delivery. Some assembly may be required. Gondolier outfit sold separately. Note: Pool Godolas are currently on backorder due to Venetian woodworker’s vacation schedules and a current Larch, Fir and Cherry timber shortage as a result of current dam building activities in China. In the meantime, we suggest enthusiastic backyard gondoliers begin training with inner tubes and garden rakes.